In this stunning true-crime thriller of Facebook, catfishing, and jealousy, a double murder begins with the click of a button. Chris was a CIA agent who was concerned about Jenelle. Seeing the cyberbullying she had endured, and worried for her safety, Chris got in touch with Jenelle's protective parents and her devoted boyfriend, warning them that Payne and Hayworth were a danger to Jenelle. He got especially close with Jenelle's mother, Barbara, who thought of Chris like a son, though she had never met him. Chris claimed that surveillance of Payne and Hayworth revealed that the two of them were planning on harming Jenelle, that it was imminent, and that something needed to be done immediately. Chris promised that he would have their back if they were to act to protect Jenelle. And so they did. Jenelle's father, Buddy, and her boyfriend, Jamie, broke into the home of Payne and Hayworth and murdered them in their own home. What the police investigation turned up, though, made this crime all the more terrifying. Jenelle had been Chris the entire time, catfishing her family and her boyfriend to act in vengeance on her behalf. Using forensic linguistics and diving through the brambles that Jenelle laid to cover her tracks, police were able to put together a chilling portrait of a sociopath made all the more ruthless by the anonymity of her online life. Bizarre and unforgettable, Dennis Brooks examines the crime and trial from all angles, bringing his expertise as the lead prosecutor in this strange and disturbing case. 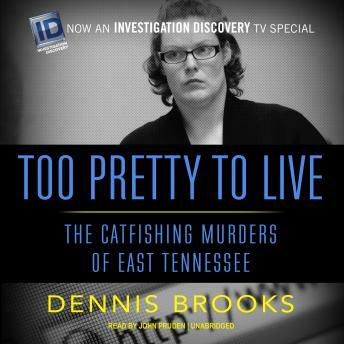 Dennis Brooks does a great job going inside the twisted world of the Potter family and the strange delusions that led to their murderous acts. As the prosecuting DA on the case, he obviously had access to all the details from the beginning, but his own curiosity led him to delve even deeper into what made them all tick. This is a well-paced, well-plotted story that will have you shaking your head in amazement.